From pixies to bobs, and even red carpet-worthy waves, we’ve got everything covered. When considering a haircut, it’s important to choose a look that suits not only your personality, but also your face shape. A hairstyle that complements your facial structure will work wonders in highlighting your best features and will prove easier to style on a daily basis. So take it from us: it’s definitely worth knowing which cuts will enhance, rather than hinder, your complexion. Want to know all about the most flattering hairstyles for heart-shaped faces? Then you’ve come to the right place. Measuring wider at the forehead and narrower at the chin, heart-shaped faces have the benefits of looking very feminine and boasting to-die-for cheekbones, which you should definitely make the most of. No wonder we see so many genetically-blessed A-list personalities with heart-shaped faces, including the likes of Claudia Schiffer, Naomi Campbell and Jennifer Love-Hewitt, to name but a few. Safe to say, you’re in good company. So what are you waiting for? Keep scrolling for our round-up of the best hairstyles for heart-shaped faces, now. Not many people can pull off this chic, bold look, championed by Michelle Williams a couple of years ago. However, those with heart-shaped faces are one of the lucky few who can. This short and choppy pixie cut is perfect for accentuating your cheekbones and giving your sweet, feminine features a cool, contemporary edge. It’ll also help draw attention away from the forehead, resulting in more balanced proportions. Try using the VO5 Classic Styling Soft Moulding Wax (£2.99*) to add extra detail and texture to your short, choppy pixie. It will also tame pesky frizz, while adding long lasting definition. Often seen on and off the red carpet, the graduated bob has been on our radar for quite some time now – and it works a treat on heart-shaped faces. Designed to enhance your cheekbones, while also drawing attention away from your top-heavy face shape, this hairstyle not only flatters but feels ultra modern and chic, too. Team with a sleek side parting like Rosamund Pike, or add long, piecey bangs a la Reese Witherspoon for a more playful, feminine look. A longer, fuller-bodied fringe is a sure-fire way to balance out the triangular proportions of a heart-shaped face, and when paired with a fashionable chin-length bob, the results look super fresh and modern. Take your cue from Halle Berry, who added subtle, messy textures and light movement to her bob for a playful and effortlessly polished look that will suit women of all ages. Casual, contemporary and easy to style – definitely a winning look for us here at the All Things Hair HQ! Love a bit of old Hollywood glamour? Good news: if you have a heart-shaped face, this is a look you’ll definitely be able to pull off with aplomb. If a sophisticated cocktail party is where you’re heading, retro waves with a deep side parting – worn with a sultry mahogany shade here by Margot Robbie – are sure to get you noticed for all the right reasons. The side-swept fringe works wonders in drawing the eye away from the largest part of your face (your forehead) and, instead, helps to frame and accentuate those amazing cheekbones. Editor’s tip: don’t forget to use a heat protectant, like the TRESemmé Keratin Smooth Heat Protection Spray (£5.50*), when using your heated styling tools to recreate this look. It’s formulated with keratin, to help reduce frizz and also acts as a ‘barrier’ to heat from curling wands and straighteners. Midi cuts work a treat on heart-shaped faces, so if you’re a fan of this on-point and easy to maintain just-past-the-shoulders length, then you’re in luck. 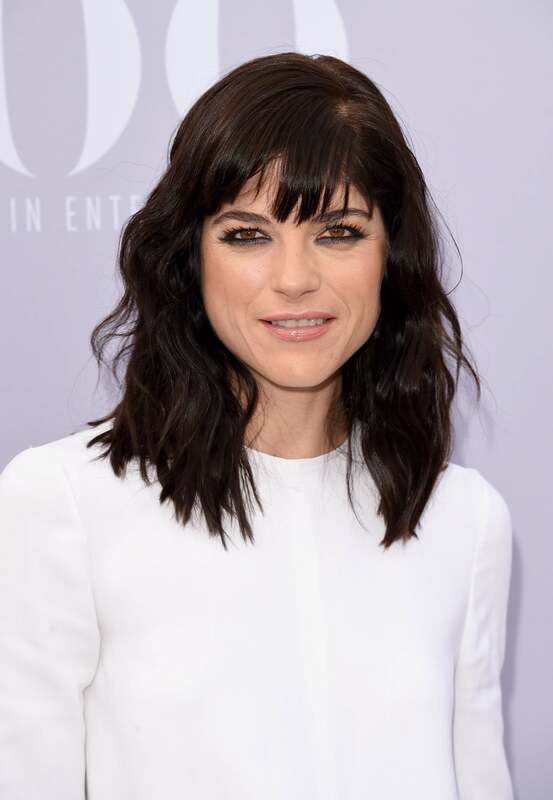 Take a leaf out of Selma Blair’s book and work in shaggy, effortless waves and a piecey fringe that hits just below the brow bone (this will help conceal a larger forehead and balance out your facial proportions) for a look that’s cool, casual and ultra modern all at once. The bonus? It requires minimum styling and is bang on trend, too. Editor’s tip: when recreating this look, finish off your ‘do with the Toni&Guy Casual Flexible Hold Hairspray (£7.49*) – it’s great for providing lightweight hold with natural movement! RRPs are Unilever suggested retail prices only, it is at the discretion of the individual retailers to set the actual price.